Volcano Veggies, Bend’s aquaponic farming operation, got a vote of confidence at the mid-October Bend Venture Conference, in the form of the $10,000 BendBroadband prize and the $1,500 Palo Alto LivePlan Software award. The fact that Volcano Veggies was able to make an impression at the largest Angel Conference in the Pacific Northwest signals that Volcano Veggies impressed with its innovative growing practices, offers desirable products and potential for growth. Jim and Shannon Sbarra, co-founders of Volcano Veggies, will use the funds to more than double their produce production, while continuing to refine their processes. What helped Volcano Veggies stand out at the conference? A sustainably grown, healthy, organic product that doesn’t harm the environment. Their produce, primarily dark greens such as kale, collards, and chard; salad greens including romaine, mixed, and butter greens; and basil, is 100 percent organic and can be grown locally year-round, unlike traditionally-farmed produce. 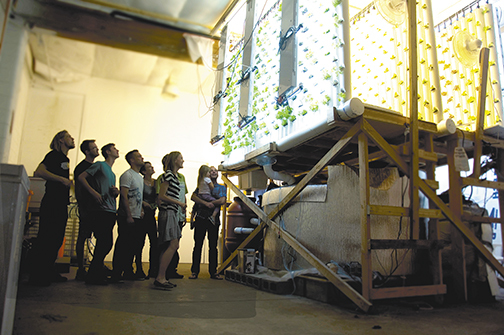 Their aquaponic growing method uses 98 percent less water than other farming methods, without producing pollution, such as nitrates, in the process. “We’re offering a healthy, environmentally-friendly product, using sustainable methods, while supporting the local economy,” Shannon said. How does it work? Simply put, Volcano Veggies grows a variety of salad greens and herbs atop 1,200 gallon fish tanks. Production takes place inside a warehouse, in downtown Bend, using both grow lights and natural light. Waste from the fish is collected, allowed to break down, then used to water the plants. The nitrate-rich water fertilizes the plants in a healthy, strictly organic way. No pesticides are needed because the plants are grown in an insect-free environment. Water trickles back through the plants and aerates the fish tanks below. Because production takes place in a closed environment, consumers can feel good that the quality of their food is secure. “Our plants are happy and well fed,” Shannon said. “From the consumer point of view, our produce also lasts longer.” She notes that most lettuce travels an average of 1,200 miles to reach the consumer. Volcano Veggie’s produce typically travels less than 10 miles. “Given that 40 percent of nutrients are lost within four days after harvest,” Shannon said, “that’s significant.”Next year, Volcano Veggies will start growing cilantro, parsley, thyme, and other herbs, followed by microgreens, strawberries, and tomatoes. With several potential new investors, and the Bend Venture Conference funding, Volcano Veggies is ready to begin building a second growing system. “It’s all very positive, very exciting,” Shannon said. With the ability to grow more produce, they’ll be able to take on additional restaurants as clients, as well as offer their produce to more local markets. To conduct your own taste test, you can purchase Volcano Veggie’s produce at markets such as Locavore, C.E. Lovejoys, and Newport Market. Or, try a restaurant sampling at the Old Mill BrewWorks, Mauna Kea Grill, Local Slice,or Brother Jon’s. Outlook for Growth: Expanded production capability will allow Volcano Veggies to expand and increase production, offering an increased variety of products to local markets. Lauren writes to inform and entertain. Her background includes editing, technical writing, promotional writing, and writing for magazines. She enjoys telling a good story, no matter what the topic.